Welcome back, Manatees! Multiple spots showing manatee families along the city tour route. Lots of babies! My forecast for this winter is above average Manatee conditions in MIami. Lots of babies and families seen. The Everglades, however, i think will be below average for manatees due to red tide and continued disruption of sea grass from Hurricane Irma last year. This has been a rough year for Gulf Coast Manatees. 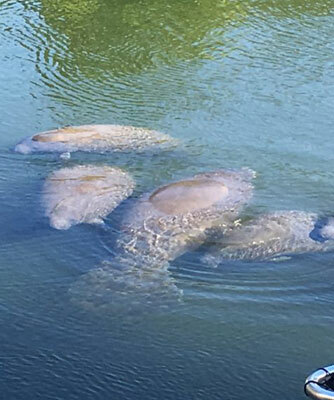 763 manatee deaths in 2018 as of mid november is the most deaths since the record breaking cold of the winter 2010/2011, when a record number died from hypothermia, again, mainly from Collier to Pinellas Counties. Naples to St Pete. 38% of Manateee deaths come from two counties, Lee (Fort Myers) on the Gulf and Brevard (Space Center) on the Atlantic. 65% come from Collier County to Tampa, and the Atlantic county of Brevard County, this time due to red tide.